American Lobster Pictures. 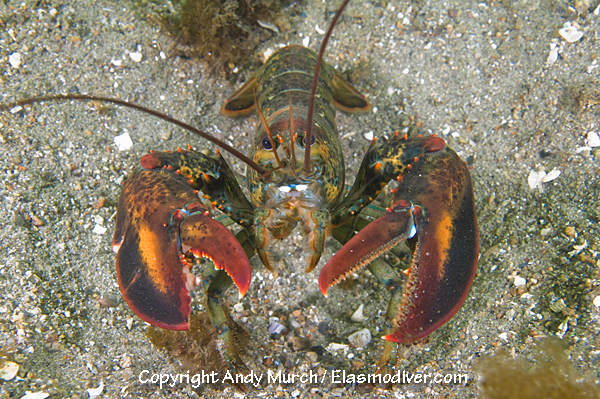 Images of the clawed lobster Homarus americanus. 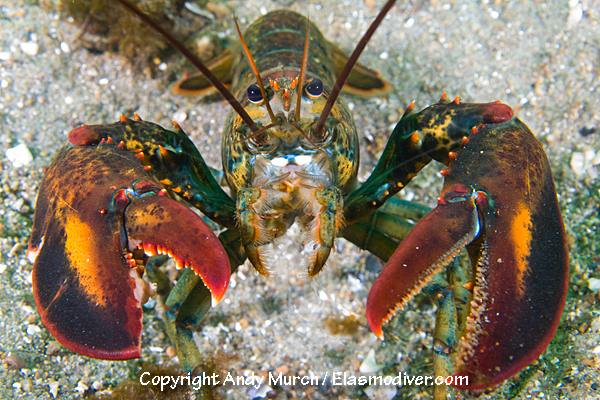 COMMON NAMES: American Lobster, northern lobster, maine lobster, clawed lobster. DESCRIPTION: The unmistakable American lobster has large orange/red tipped claws. Its carapace and adomen are generally shades of orange/brown fading to blue/black. Mottling is sometimes present. It can weigh as much as 20kg making it the heaviest crustacean in the world. RANGE: Western Atlantic Ocean from Labrador in Canada to North Carolina. All of the lobster images on elasmodiver.com are copyright protected. No unauthorized use of these American Lobster pictures is permitted. Please contact Elasmodiver for further information.